This may not look like a very impressive car, but bear with me. You probably have a better chance of seeing a Porsche on today’s roads than seeing one of these babies. This is a car from a brand that no longer exists and, fittingly, it represents a type of car that is on the verge of extinction. Ask a kindergartener to draw a car and they’ll probably come up with something like this: a four-door sedan with no curved lines other than the wheels. At one time, this Platonic automobile really was the most common sight on American roads. 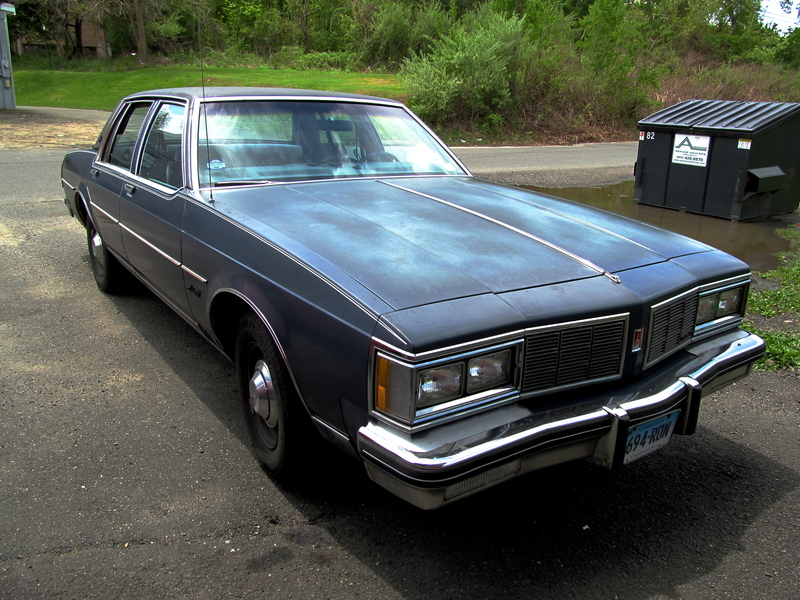 If it wasn’t an Olds Delta 88, it was a Chevy Caprice, or a Ford LTD, or a Dodge Monaco. Today, however, the automotive landscape is much more diverse. Cars try to be all things for all people, which is why we have crossovers that look like tough 4x4s, but are actually based on front-wheel drive sedans, and “four-door coupes” that try to combine style and practicality. In contrast, the big American sedan has become a niche item. There are still a few around (Dodge Charger, Chevy Impala, Chrysler 300, Ford Taurus) but they are the automotive equivalent of vinyl. That’s not exactly a bad thing. Today’s cars are safer, faster, and better for the environment than this gas-guzzling Olds, although maybe not as old-school-cool. Either way, this 88 is a noteworthy sighting. It’s both a historical reminder of a time when cars were expected to have the square footage of a small apartment, and a rare car in its own right. Oldsmobile may have made legions of these things back in the ‘70s. but you’d be hard pressed to find one on the road today. That’s why I’m glad I did.